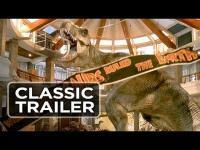 Jurassic Park 3D revitalizes the franchise that put dinosaur movies back into the mainstream. We get the original movie with the 3D treatment that should amaze the next generation. Jurassic Park 3D will be hitting theaters this upcoming April 5, 2013. Everyone knows that the film is about a bunch of cloned dinosaurs on a remote island who escape their cages. A bunch of survivors must try to find a way off the island without getting getting eatened by the dinosaurs. That is the quick synopsis about the movie but Jurassic Park is a great movie on the whole.